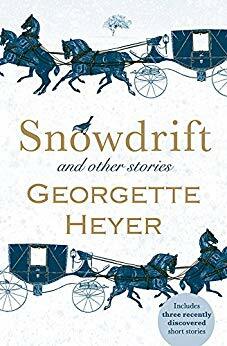 I am a die-hard Georgette Heyer fan and have sincerely loved Sourcebooks' elegant, well-made reprints of her work, so it pains me to say this, but despite the great cover art and a couple of solid entries, the short story collection Snowdrift is for Heyer completists only. Snowdrift is a collection of fourteen short stories that were published over the course of Heyer's fifty-year-long career. Most of them were previously collected in the book Pistols for Two; three were more recently discovered. Nearly all of the stories are set in the Regency period, and the book includes a short foreword by Heyer's official biographer, Jennifer Kloester. Admittedly, there are some delightful stories in this collection, but there's just too much overlap: fully eight of them center around an unplanned meeting in an inn, an unexpected carriage ride, or some combination of the two. Why not just read the full-length novel Sylvester, which features the same plot elements, but explores them with far more depth and heart? And the remaining stories are of wildly uneven quality—ranging from sweet to straight-up unpleasant. I genuinely enjoyed about a quarter of these stories, and was mildly amused by a quarter more, but $13.99 is simply too much to pay for less than 150 pages of readable material.